Whether relaxing in the privacy of your luxury room, or discovering the rich plant and bird life at the resort's vast green spaces, you can never tire viewing the natural environs at The Rangers Reserve. However, for the more adventurous, we have specially designed activities to take you outdoors for experiences to remember for a lifetime. These experiences have been carefully developed to suit individual requirements. 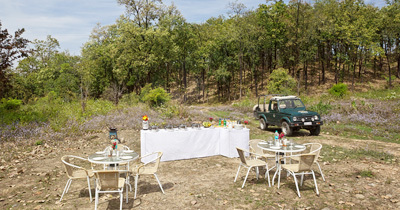 At the edge of our private forest, adjoining the wildlife reserve with mountains in the backdrop, enjoy specially laid breakfast or lunch cooked on the spot in traditional chulas (stoves). 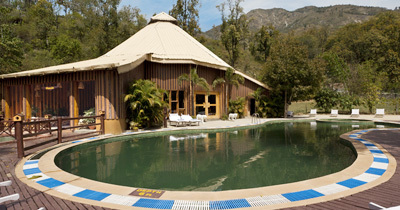 Secluded and undisturbed, you have nothing but the beauty of the jungle and distant mountains for company. Ride and trek through the dense Sal forest to a tribal village that has no electricity; wher villagers live on their own agricultural produce and natural spring water. 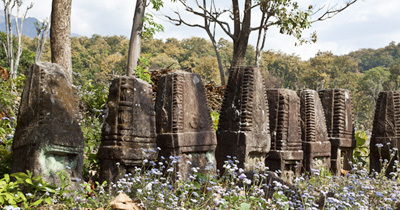 The ageless temple pillars in the village, said to be over 3,000 years old, some still with distinct carvings, are a sight to marvel. The village has been adopted by The Rangers Reserve for its welfare. Keep a date with the pride of the Corbett, the famous Corbett tiger. Or go on a trek in some of the most exhilarating trekking and walking trails in the region, accompanied by a trained naturalist. Spend a day by the Kosi river at Okal Dhungi village, a 30 minutes jeep ride, where best Mahseer can be your game. 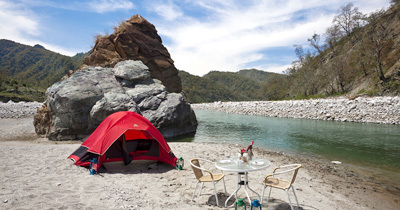 Enjoy the beautiful span of the river beach where a tent is pitched for snacks service. 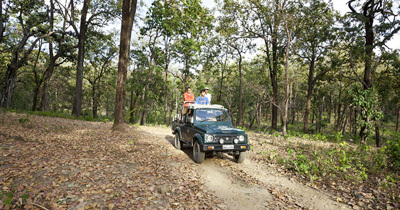 Experience beautiful forests en route and local villages on narrow winding roads. After a day full of activity, the comfort and luxury of your home awaits. Rejuvenate yourself with a refreshing swim in the infinity pool located on an elevated level with expansive views of the forests. Or invigorate your body and soul with a pampering massage at the Spa. 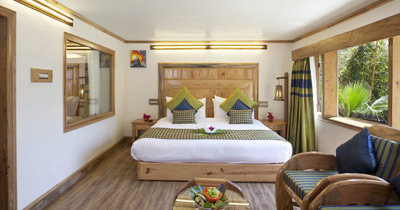 Try a game of table tennis or billiards in the natural surroundings or let your fingers track the queen on a carom board. Exclusive setting for private dining under the stars. As the sun sets in, evenings take on a different mood at The Rangers Reserve. 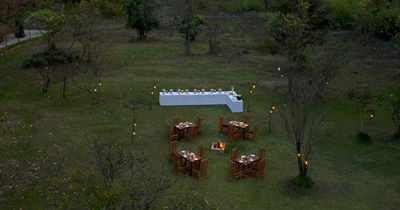 Those in pursuit of a quiet, private dinner can enjoy intimate, secluded setting for a unique lantern lit dinner in the backdrop of the magnificent forests. Or just relax at the open air grill where the evening barbecue sets the mood with succulent kebabs while a bonfire keeps the spirits alive.